When is one>two and seven==eight? So Google recently released the Google books N-gram viewer along with the datasets. There’s been plenty of press about it, and the Science article based on this data is an interesting read. I was trying to come up with a simple, yet insightful query. My initial trial was modernism,postmodernism which immediately had me wondering about hyphenation or the lack thereof… In any case, the upshot seems to be that the use of the term postmodernism started 1978ish. Neat, though I think I won’t need to clear space for my Nobel Prize anytime soon. I toyed a little bit with other terms like generation X which has an odd sort of bump in the graph around 1970. Not sure what’s up with that, though perhaps there’s some data collection artifacting as discussed in this article. I wasn’t inclined to deep end on this and was happy enough to have my prior knowledge confirmed by noting that the use of “generation X” took off in the mid 1990’s. My final trial was a bit more on the minimal side: one,two,three,four,five,six,seven,eight,nine,ten. There shouldn’t be any surprise here that “one” is more common than “two” is more common than “three”, is more common than “four”. It probably shouldn’t be a surprise that each succeeding number is less frequent by roughly a factor of 2. Less intuitive (to me anyway) is that “ten” squeezes in front of “seven” and “eight” (OK, so maybe it’s a round number), “seven” and “eight” are basically tied, but even more odd is that before 1790 or so, the putative occurrence of “six” and “seven” were virtually non-existent. Turns out it appears to be the same issue with the “medial S” that Danny Sullivan describes in greater detail in his post. In other words, it’s an artifact of OCR and an indication of the evolution of typography rather than the evolution of language. One mystery solved; now why are “seven” and “eight” tied in frequency? Kudos to Google for releasing the viewer and data. 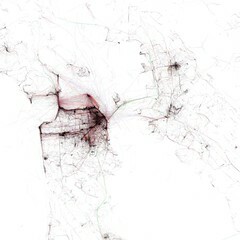 Eric Fischer recently published a visualization of traffic in the Bay Area based on location and time data associated with photographs. It’s a lovely image that traces the major routes in the Bay Area and highlights points of interest to locals and tourists alike. The image is beautiful, reminiscent of sketches or studies done in preparation to painting. But what about its effectiveness as a visualization? What does it tell us that we didn’t know? Think about your own mental model of San Francisco, and where you think the interesting or appealing places are. I.e. if you were visiting the city and/or out for the day taking pictures, where in the city would you go? You’d probably go to Golden Gate Park, to anywhere along the water, and to the downtown shopping areas (the grid around and north of Market). And that’s pretty much what the map shows, right? So we don’t really learn much from this, do we? It confirms our existing intuitions. The militant wing of the Visualization Brigades recently published its manifesto, shown on the right. The War on PowerPoint is escalating, and at this pace, threatens to overtake the War on Drugs in the near future. What are we to do? Is minimalism the most effective way to convey information, as Tufte preaches? Or is Tufte’s argument backed by nothing but his personal sensibilities, rather than hard evidence? An upcoming CHI 2010 paper (one of the CHI 2010 best paper award winners) argues that elaboration is not all bad (or perhaps that not all elaboration is bad). In the spirit of Many Eyes, Jeff Clark has been developing visualizations of various kinds, including those of various Twitter collections. For example, his Twitter Venn diagram looks at intersections of tweets with three user-specified terms to help understand something about the way different concepts co-occur. Other visualizations look at word distributions associated with pairs of terms, and term use timlines. The graphs are pretty and, perhaps, informative. 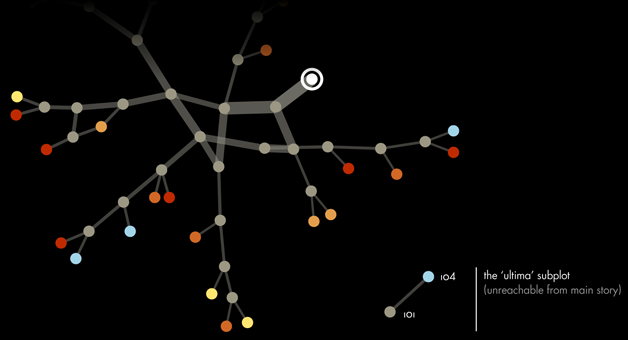 His goal is to visualize complex data that don’t lend themselves to standard bar and pie charts. When these visualizations are effective, they can reveal insight that textual representations fail to convey, but the trick is to understand what is effective when. Tufte‘s design guidelines are a start, but one based on a rather static notion of data visualization. Apparently Bertin was more attuned to interaction, but was still trapped in a static medium. Historically, the Hypertext research community is an intertwingling (a Ted Nelson-logism) of three distinct strands — structural computing, interaction, and HT literature, which could be mapped, roughly, onto the engineers, the HCI folk, and the humanists. While engineering and HCI aspects were somewhat necessary for HT literature, the focus, by definition, has been on exploring the boundaries of electronic literature. In the end, I think, it’s good writing that makes hypertext literature interesting much more so than clever interaction. In fact, the electronic component is often not necessary at all: see If On a Winter’s Night a Traveler, for example. But there is room for beauty in interaction as well. Thanks to Mark Bernstein of Eastgate, I came across a beautiful set of visualizations of narrative structure of CYOA, a series of hypertext books for children. Through a variety of charts and graphs like the one shown here, the author of these diagrams conveys the many alternate paths through a each story in the collection, and uses these visuals to compare, to analyze, and to appreciate the books. And don’t forget the animations, accessible through a link near the top of the page. My retelling won’t do it justice; take a look for yourself, and think about these designs next time you’re building a slide deck. Finally, since these stories are now available as Kindle editions, in principle, it would be possible to collect actual reading paths that readers take through the works, and subject them to the same analyses. What sorts of hypotheses about reading, personality, and interaction could we answer with such data?